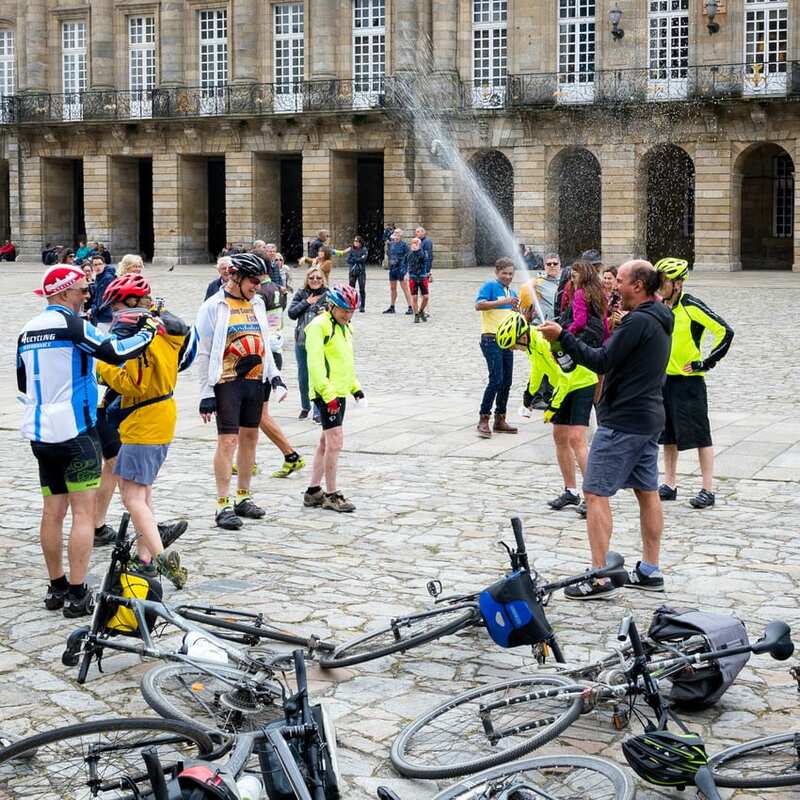 Cyclists celebrate the end of their pilgrimage with champagne. Photo: Russell Cothren. Sophomore economics and international relations major Tenley Getschman muses over the differences between our Honors Passport experience of the Camino and that of the pilgrims who actually walked or biked the hundreds of miles to reach Santiago de Compostela. Rather than letting our “cheating” get her down, however, Tenley transforms the dissonance she feels into plans for the future. We’d made it! After many long bus rides and one two-hour hike, Santiago de Compostela Cathedral lay before us, one side covered in tarp and construction, in all its glory. My group made half-hearted jokes about how hard it had been for us to get there, sitting on buses and staying in nice hotels. We had seen real pilgrims, the people walking or riding the approximate 500 miles from their starting point in Paris or Arles or Toulouse, relentlessly plodding with their hiking backpacks and sticks. With shells on their hips, their unabated determination was striking to me. After a few minutes to examine the outside of the church, we broke for lunch. My stomach had been hurting that day, so I told my friends to go ahead while I stayed in the square a while. Despite it being late May in Spain, the heat wasn’t bad, so I sat enjoying the sun and watched the pilgrims for a while. The new arrivals, sweating and tired, would turn the corner around the Cathedral in a constant stream. I watched as they turned to face the cathedral and whooped and cheered. Some of the cyclists threw their bikes over their heads, while giant groups got into huddles and hugged. And the square in front of the cathedral was full of these travelers, sitting against their backpacks or laughing together. 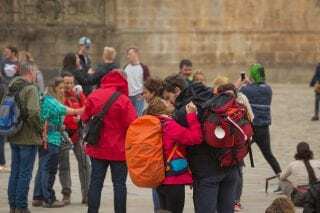 Pilgrims exchange a kiss in the Praza do Obradoiro, located in front of the Cathedral of Santiago. Photo: Russell Cothren. Our journey had been much different from theirs, so much so that I thought of myself as alien to them. The Camino de Santiago we had traversed had focused more on the historical context of the pilgrimage, as well as the architectural designs of the churches that dotted the path. From the ominous Notre Dame to humble Conques, each place housed new and interesting churches and chapels. Truly it was a far cry from sitting in a classroom watching a powerpoint. I didn’t have to imagine the sweeping arches or candlelit halls of Notre Dame. As a military kid, I’d grown up in Europe, and my parents had dragged me to cathedral after cathedral to marvel at its scope and grandeur. But before my study abroad, I had never taken the time to do in-depth research. Why were there pictures above the massive doorways in chapels? What had made medieval sculptors choose such angry looking figures? Why was that sculpture holding his head under his arm? All these questions were answered fully during my trip. That being said, did I feel like we deserved to feel accomplished for making it to Santiago de Compostela? No, I felt like a cheater. Around me pilgrims jumped up and down or just sat, exhausted and elated. I wanted to feel the same excitement and sense of completion that they had. Well, said a small voice in my head, you can someday. It’s not like this is the only time you can take this path. And when you do walk those hundreds of miles, you’ll have more appreciation because you know the background of the places you’ll witness. This was a revelation for me. Of course, I could become a pilgrim later in my life. This thought cemented in my mind. Using the far-reaching knowledge I had gained from my faculty and peers, I would one day traverse the Camino de Santiago in its entirety. My Honors Passport trip hadn’t concluded at the Cathedral of Santiago de Compostela, it had started there, in a way. For the first time since the beginning of the trip, I felt a connection to the pilgrims, and knew that one day I would number among them. 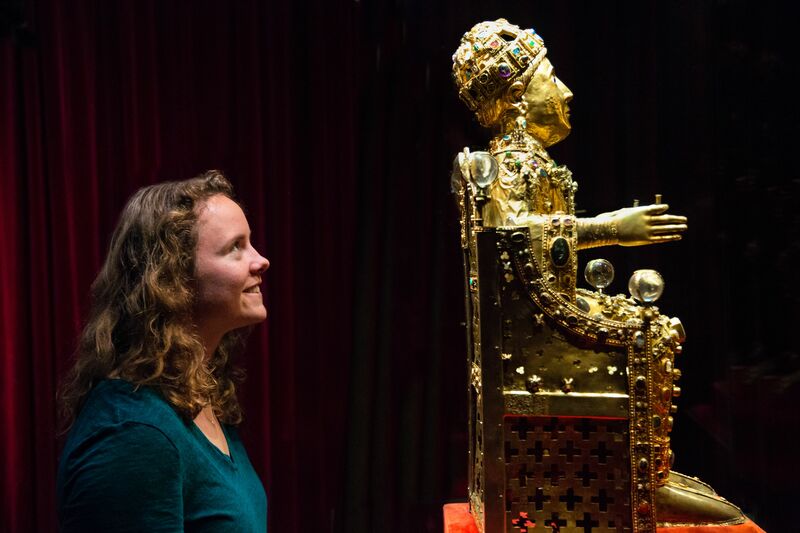 Tenley looks up at the head reliquary of Sainte Foy; she presented on the saint and her many miracles in the treasury of the Abbey Church of Sainte-Foy in Conques, France. Photo: Russell Cothren.